Four images from New Horizons’ Long Range Reconnaissance Imager (LORRI) were combined with color data from the Ralph instrument to create this global view of Pluto. Author: NASA / Johns Hopkins University Applied Physics Laboratory / Southwest Research Institute. Source: Wikimedia Commons. WHY IS PLUTO’S ORBIT SO OUT OF ROUND AND TILTED? 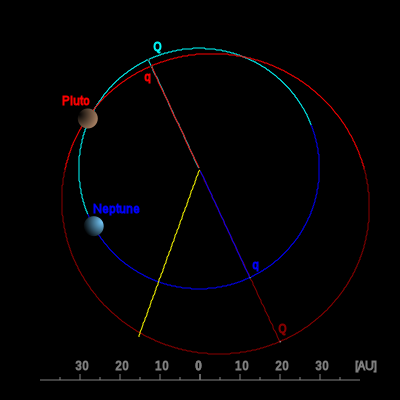 Orbits of Pluto (red) and Neptune (blue); polar view. Plotted by a program written by Eurocommuter. Source: Wikimedia Commons. All the major planets of our system have orbits that are mostly round and mostly lined up within 7 degrees of the equator of the sun. This odd orbit is very different than the other planets but similar to Kuiper Belt objects, small bodies that orbit far from the sun and form a thick belt around the solar system (think comets and giant icebergs). Maybe Pluto’s strange orbit is because the dwarf planet is just a large, close Kuiper Belt object (like a comet), maybe its orbit was disturbed by the gravity of the giant planets (the math does not really match this idea) or maybe some other reason ????? WHAT IS HAPPENING TO PLUTO’S ATMOSPHERE? How much does it change, how long can this go on and what other strange effects does it have on the planet’s surface? 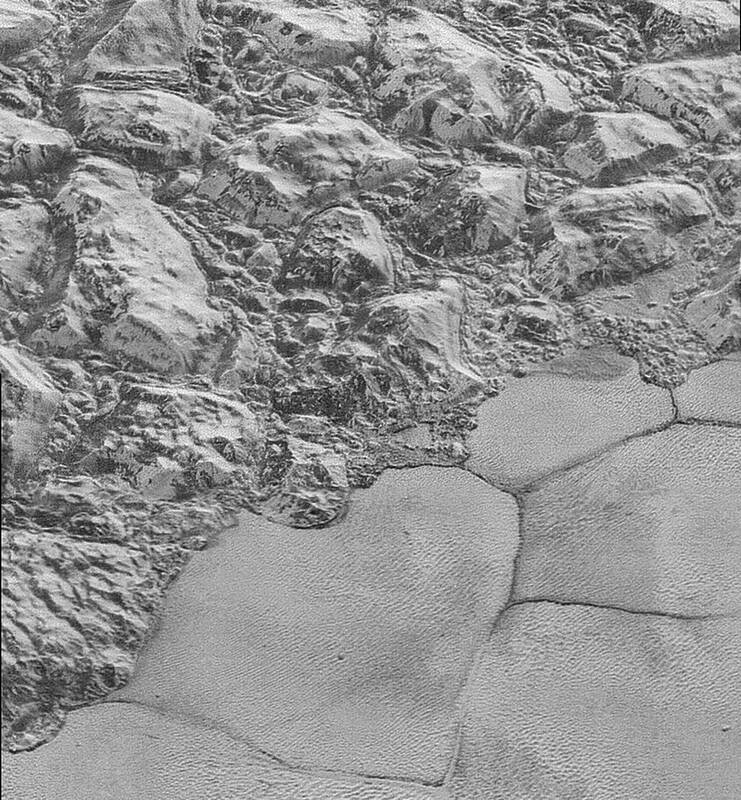 HOW WERE THE “DUNES” OF PLUTO CREATED? The New Horizons space craft took some remarkable photos as it passed by Pluto. As scientists study them they are finding some unexpected terrain. They certainly did not expect to find things that look like sand dunes or snow drifts! Dunes and drifts are formed by wind, but Pluto’s atmosphere is so thin it cannot lift and carry any type of particle. But we really do not know for sure. IS PLUTO A PLANET, ICE DWARF OR HUGE COMET? We don’t really know for sure!! First of all, it depends on how you define “planet”. 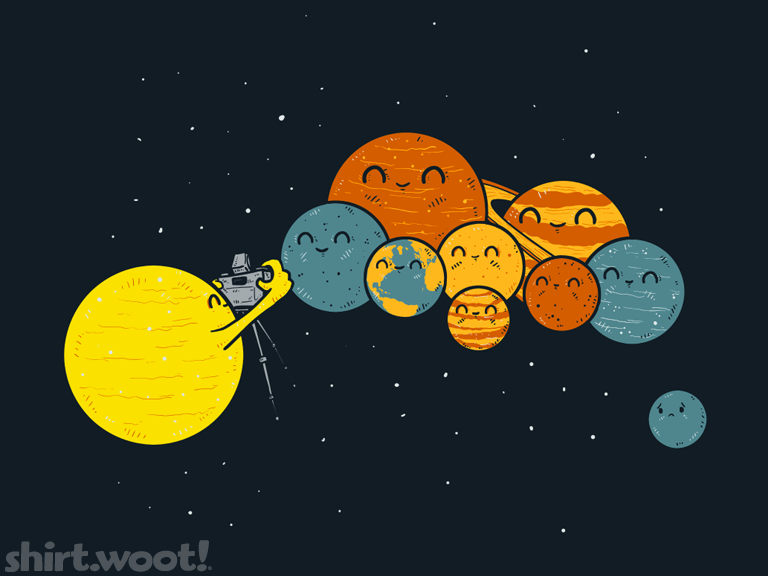 Pluto is round, orbits the sun (not another planet), and has mostly cleared its orbit of other debris. 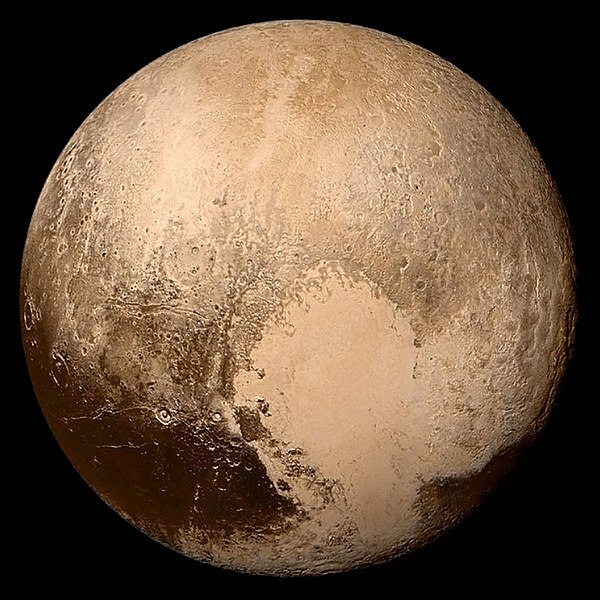 The most recent official definition of planet excludes Pluto because it has such a strange orbit and has not COMPLETELY cleared its orbit of other objects. If you call Pluto a planet, then you need to also include several recently discovered objects that orbit beyond Pluto. Based on measurements taken by the New Horizons space craft, Pluto’s composition is closer to a comet than any of the other planets or their moons. It has a lot of water ice and lots of frozen nitrogen. Based on its weird composition and strange orbit, I think Ice Dwarf fits the best. WHY DOES ANYONE CARE WHETHER WE CALL PLUTO A PLANET OR SOMETHING ELSE?? 1)People, especially Scientists, like to group things together based on similar characteristics. So we have to know what something is before we give it a “correct” group name. Pluto is like the other planets in some ways, but really different in other ways, so that makes some scientists nervous. 2)A lot of people living today know that Pluto used to be called a planet but got knocked down to ice dwarf or dwarf planet when a committee decided to change the definition of “planet”…… Most of us like to cheer for the “underdog”, even when it is a giant ball of ice we can barely see. Answers to most of these questions will require another mission to Pluto with an orbiter and lander. It took several years to design, build and test the New Horizons spacecraft, then 9.5 years of space flight to get to Pluto. So, it will be several years before we visit that ice world again. Space Out Day. Ralph Phillips will be there to present on a variety of topics.